Because April is Autism Awareness Month, The Root is highlighting a black British artist on the spectrum whose work will amaze you. 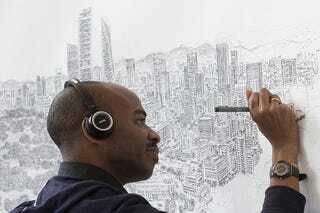 Stephen Wiltshire was diagnosed with autism at age 3 and today is one of Britain’s most celebrated artists. After a cursory glance, he can draw entire landscapes of cities from memory with amazing accuracy. National Geographic reports that Wilshire got his very first commission from the British prime minister. He struggled with language, but by age 13 he had published his first book of drawings. In 2006, Prince Charles presented Wiltshire as a member of the Order of the British Empire for his contributions to the art world. That year he opened his own gallery in central London. Today his photograph welcomes visitors to London’s Heathrow Airport. On a trip to New York, Wiltshire met Oliver Sacks and drew a perfect replica of the neurologist’s house after taking a quick glance at it. He also took a 20-minute helicopter ride in the city and then sketched everything he saw onto a 19-foot-long piece of paper as viewers watched live via webcam. “Despite Stephen’s astounding memory, whilst in Manhattan he still managed to get lost and walk 45 minutes in the wrong direction before finding Cheyenne’s Diner,” notes an anecdote on his official website. “The combination of great abilities with great disabilities presents an extraordinary paradox: how can such opposites live side by side?” Sacks later wrote in the foreword to Wiltshire’s second book. In 1989, Wiltshire visited Venice, Italy, and drew his first panorama. From then on, he became best-known for his incredibly detailed cityscapes, each done from memory with hundreds of streets, landmarks and other minutiae in perfect scale, including buildings with the right number of windows. He has drawn cities around the world, from Jerusalem to Sydney to Mexico City. The estimated prevalence of savant abilities such as Wiltshire’s is 10 percent for people with autism; in the nonautistic population, including those with severe developmental disabilities, the ability is less than 1 percent. Autism is the fastest-growing neurological disability in the world. According to Autism Speaks, autism now affects 1 in 68 children and 1 in 42 boys, who are five times more likely than girls to have autism. Although early intervention is key, African Americans are likely to receive autism diagnoses one to two years later than their white counterparts. All pediatricians should test children for the signs of autism with the M-CHAT at least once between 16 and 36 months of age.